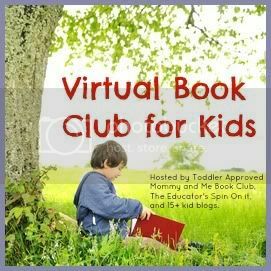 Welcome to the February edition of the Virtual Book Club for kids! This month we are featuring books by Dr. Seuss. March 2 is Dr. Seuss's birthday. This is a great month to start thinking of fun ways to celebrate! We have many favorite Dr. Seuss books. Choosing one was difficult. Luckily the Virtual Book Club for kids linky party will be open until March 17th, so I'll have several more Dr. Seuss books and ideas to link up. The first book I am sharing is Wacky Wednesday. Wacky Wednesday was written by Theodore Geisel, "Dr. Seuss", under the pen name Theo LeSieg and illustrated by George Booth. 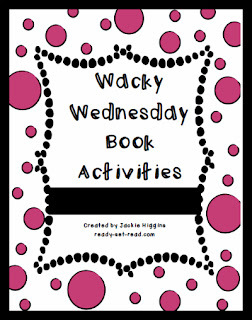 Wacky Wednesday is a very clever book because it provides picture puzzles for readers along with the classically well written rhyming text of Seuss. In this story, a child wakes up to see a misplaced shoe... on the wall. As the child moves through the morning, the book becomes a counting book of wacky items. Your little readers will be eager to help the main character solve the problem and find the wacky items in the picture puzzles. 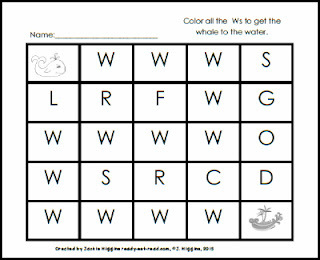 After reading the book, Wacky Wednesday, we created wacky pictures, did some wacky counting, and investigated the letter w. I also created a Wacky game that didn't work well at home with my preschool boys, but would be great for a classroom Wacky Wednesday celebration or a library story time. We are HUGE fans of the "That's Silly" pages in the Highlights High Five Magazine each month. These pages are silly pictures that are similar to Seuss's picture puzzles in "Wacky Wednesday". With my youngest boy, I still have to point to the pictures and say, for example, "See that penguin selling popsicles, that's silly." And then I have to laugh. He likes when I laugh. My older son (4 1/2) now points out all of the silliness to me. He thinks he's super funny. He also likes when I laugh... at everything he says. According to the Highlights Parent Teacher Guide, the "That's Silly" pages can help children's vocabulary grow, help children make inferences, and help children make sense of visual information. We created our own wacky pictures. This was definitely too hard for my three year old, and it was a challenge for my four year old, but with a lot of modeling he could do it. I let him clip some sillies and then create some of his own by pasting pictures together. For instance, we took a picture of a girl walking a dog, clipped out the dog and put in a shark. 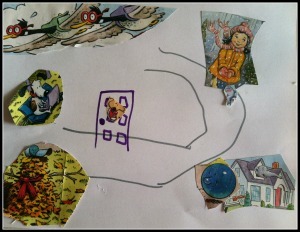 He also drew a door in the road like he had seen in the book and added a shoe to the door, like in the book. Since Wacky Wednesday is a counting book we did some wacky counting. Here were some of the "wacky and wild" ways we counted. count by 2s, 5s, 10s, etc. After reading Wacky Wednesday, we talked about the words "wacky" and "Wednesday", and what letter we would expect to see at the beginning of the words wacky and Wednesday. After discovering it was "w" we did a letter w maze to practice letter recognition. 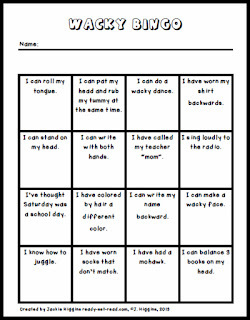 To celebrate Wacky Wednesday with a class or during a library story time, you might want to play wacky bingo. In this game, students are given a bingo board. They must find someone who has completed one of the wacky tasks on the game board. That person must sign the game board. Once the game board is filled up, the student sits down. The first person to fill the game board wins the game! I can pat my head and rub my tummy at the same time. I can write with both hands. I can make a wacky face. I can balance 3 books on my head. Wacky Wednesday is a wonderful Seuss picture book that can be used to explore language concepts, counting, and letters. It is also a funny book that will make kids love reading! If you'd like all of these Wacky Wednesday activities in one packet, you can get that free by clicking the picture below. These activities really span a lot of age groups and could be beneficial to reading specialists who are looking for Seuss activities to pass along to an entire building of teachers. If you are a classroom teacher or homeschool parent, just use the activities that benefit your child on his or her level! Don't forget to link up your favorite books to the Virtual Book Club for Kids and check out other favorite Seuss books. I have never heard of Wacky Wednesday before. Thanks for sharing all of these Seuss activities! You found a lot to do with this wonderful book. I have to ask Anna which Dr Seuss book is her favorite, so we can read it for the book club! Love Dr. Seuss! Thanks for hosting the blog hop linky! 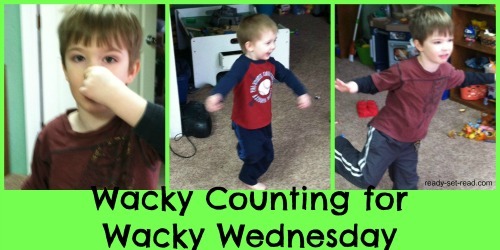 I have downloaded your Wacky Wednesday ideas and look forward to using them with Tristan! So many fun ideas! Thanks!